Cosmetic dentistry focuses on improving the appearance of a patient’s smile. It is an elective service and addresses dental treatment that is not required due to a dental problem. These are procedures patients choose to have performed and are considered smile makeovers. Cosmetic dentistry is like a dental facelift that can reverse the natural aging process of your teeth. The advances in cosmetic dental techniques allow us to perform these procedures in our office. A smile evaluation will let us know what you like or dislike about your smile or your teeth. Dr. Ediger listens to his patients to understand what their desires are and what they expect. He works closely with you to develop a treatment plan that will help achieve expectations. 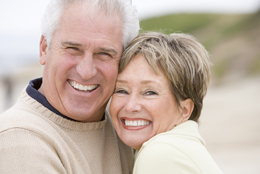 Creative cosmetic dentistry offers many options for people who are unhappy with their smiles. These comprehensive procedures include, inlays, onlays, metal–free restorations, cosmetic bonding, gum contouring, crowns, veneers, lumineers, dental implants, teeth whitening and invisalign. Since every cosmetic case is different, in order to determine the form and function of the treatment, we take actual models of the teeth and use wax to create new teeth over the original teeth. This gives the patient a visual of the final result and motivates patients to see what can be accomplished. The materials used with cosmetic procedures are the most natural-looking available—perfect in color, shape and clarity. This allows the restorations to be beautifully translucent. Cosmetic procedures help people feel better about themselves. A beautiful smile can enhance all the aspects of a person’s life. Boosting self confidence, helps people to excel both personally and professionally. We have chosen a design lab to achieve the best cosmetic results possible. We are careful to choose the best materials that will also impact the longevity of your smile makeover. Our attention to detail has proven to make the difference with completed cosmetic procedures.